​and Easter Sunday at 10 a.m.
TCF is a missions-minded, New Testament church with a nurturing, family atmosphere, a strong commitment to the integrity of God's Word(rightly handling the Word of truth 2 Tim. 2:15), and a distinctive, plural (team) leadership. For TCF, the harvest extends well beyond Tulsa into the world. Missions is the heartbeat of TCF, with about 20% of the church's membership on the field in locations around the world. TCF's shared pulpit sees different elders preaching nearly every week, but the Holy Spirit brings a common thread to the messages. 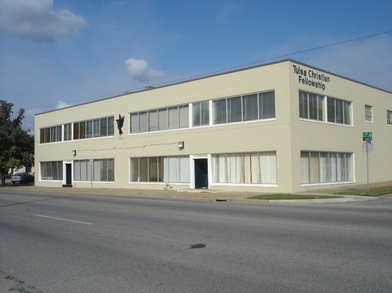 TCF's congregation is built up with solid, biblical teaching and sound doctrine, applied to the everyday lives of the believers, so that members are equipped to live lives faithful to the Lord, and equipped to serve Him with undivided hearts. A Tree Doesn't Grow Unless it has roots! You also need spiritual roots set deep into God's Word and others. We at Tulsa Christian Fellowship invite you to join us under the Lordship of Jesus Christ. Our elders and house-church leaders are dedicated to Him and to each member's growth. Let God plant you in good soil, and you will bear fruit for Him! We invite you to call (918-587-2400), email or visit us if you have any questions or personal needs.